On Election Day, the USA lost. Tonight, Bruce Pearl’s Auburn Tigers looked like the team that beat Tennessee on the road, blew out Alabama, LSU, and Vandy, and beat Kentucky at home. It looked like the team that won the SEC regular season title. This team was ruthless, efficient, explosive, and merciless in a complete 101-58 destruction of the Jaguars at Auburn Arena in the season opener. 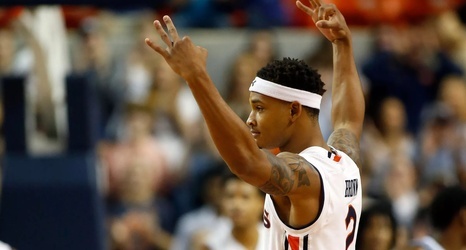 It didn’t take long for Auburn to get going, with Anfernee McLemore scoring the first points of the season on a dunk. That basket was followed by four threes by Jared Harper, Bryce Brown, and VCU transfer Samir Doughty.